On 22nd January 1989, I had another early start to reach Kosamba at 08.00; it was still cold when I arrived and passengers were wrapped in their shawls. I filmed a 1959 built WAM1 a French style electric on a long freight composed of four wheel wagons; in the foreground was an open frame signal box, a common installation on the Western railway. At the depot the foreman inspected my permit then sent for tea and biscuits prior to showing me round the shed. He arranged a cab ride for me for my return later that week and introduced me to the crew. At 08.30 whistles indicated the arrival of the overnight ng train. 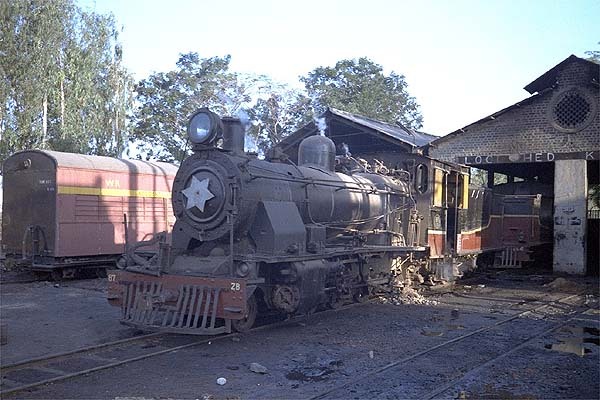 The depot had an allocation of 4 ZBs, the W class had been displaced in the previous year. Before I was allowed to take photos the foreman had insisted on the engines being wiped clean and drawn forward for me. A couple of engines based here had car hub caps as smokebox decorations. I walked along the curve past the shed, negotiating a tribal encampment. The morning departure was worked vigorously upgrade, a large contingent of passengers were riding the carriage roofs. The shed master wrapped up against the cold morning air and with the fireman monitored the preparation of ZB 88 for the morning mixed. After a visit to the Bilimora to Waghai system, I returned on 25th January 1989. The narrow gauge train was shown in the timetable as departing at 09.30, but had been locally re-timed to 10.00. Departure was 40 minutes late which, if maintained, would have meant that I would miss the last local train back to Surat. Later trains were all overnight expresses, meaning I would have to join the usually overloaded un-reserved carriage. The crew assured me that they would be back close to time, it sounded like wishful thinking! After the initial climb out of the station, the engine settled down to a quickly paced run across the flat landscape. 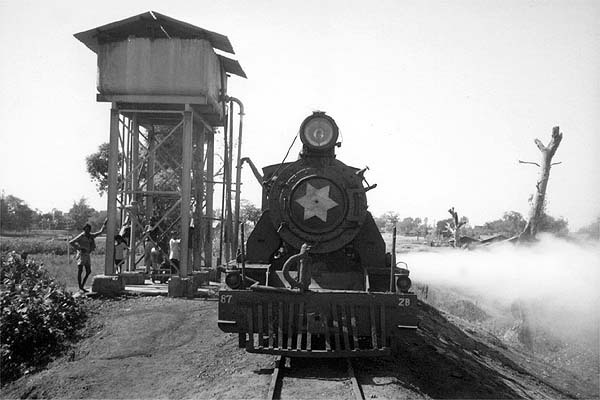 The locomotive was pleasant to ride, looked easy to fire and chewed up the kilometres with gusto. I was surprised at the number of signals along the line; these were controlled by the numerous crossing keepers. The regulator was designed for use by either the driver or fireman. For the first time in a cab I saw this in operation as the fireman was better placed to see the crossing signals we charged toward them with no reduction in speed but with the whistle blowing, it seemed to do the trick! Despite some fast running I noticed we had dropped a little time. Some of this was at prolonged station stops for tea giving station staff time to chat, the line being well out of sight of officialdom. The fireman told me the driver was unhappy with the engine, it would not reach the point where the safety valves lifted and the valves settings were out, he and the driver had reached the last conclusion by listening to the beat from the chimney which they tried to demonstrate to me. They both spent time out on the running plate, not easy on badly laid lines where the engine bucked and rolled, they were trying to diagnose a fault with the valve gear (or grandstand for me)? They claimed repairs were often not carried out properly and that the shed master accepted poor quality coal, the fire did clinker quickly and needed to be cleaned out at several station stops en route. On the run the firing irons were brought into play, after the fire was given a vigorous stir the pressure dropped and then rapidly rose: replacing the red hot iron to the tender was quite unnerving in the small cab. The crew supplemented their pay by charging for rides on the water gin. 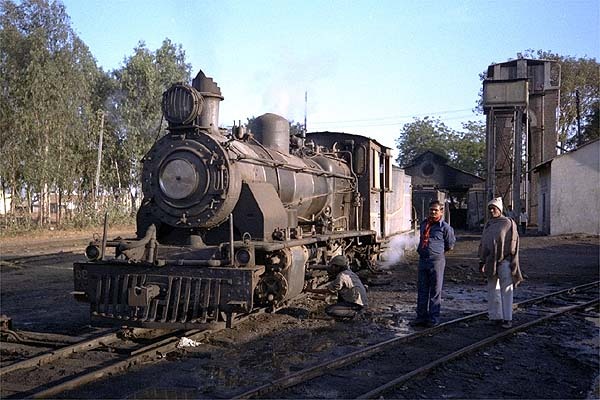 Coal was shovelled out on the run, in return the consignee would hold up a forked stick with a few rupees on it for collection, whereas that off loaded at crossing keepers’ huts was gratis. A variation on this was when the crew delivered tiffin (lunch) trays to crossing keepers and to a permanent way supervisor with his large track-gang who had obviously reached the line on their bicycles. (The tiffin trays were dropped and collected on the run). 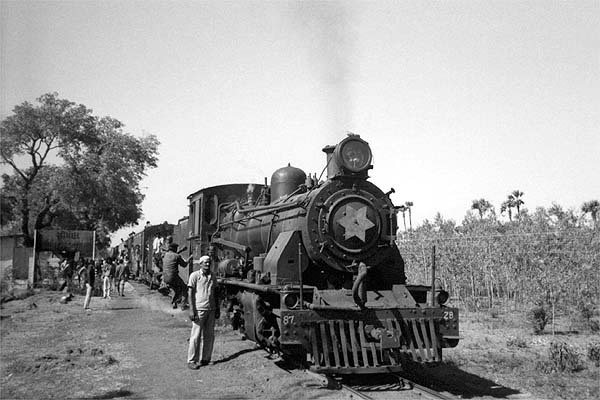 It was a lengthy branch line, approximately 62km in all passing through varied and remote countryside. Entering Zankhvav there was a stiff gradient and the engine was really working hard, then we drifted downgrade to the station at 13.00. Now running one and a half hours late; I gave up up on making my connection that night. 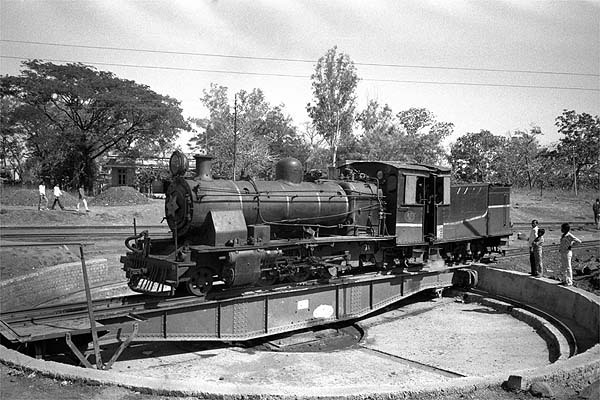 The load was reduced to 3 coaches, the same load the W class handled when they worked the line. It was more about braking power than horsepower that determined the load. Water was taken from a tank pumped from the stream below, locals queued with their containers to get water from the tank. 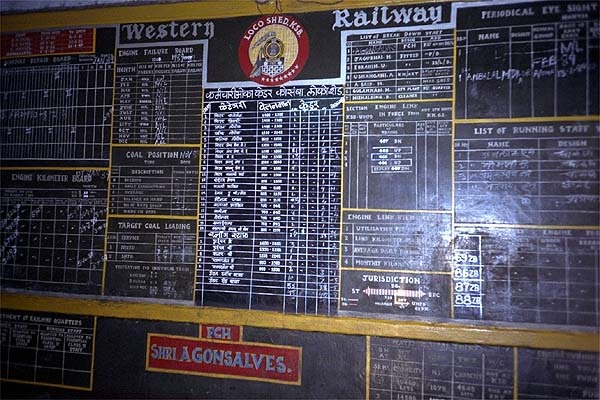 I took tea at a stall whilst the crew completed the shunting, I noticed the station was 409 feet above sea level and the climb to Umarpada begins in earnest from here. The coconut palm groves were left behind and onward from Zankhov it is a journey through the foothills with only wood cutters and goat herders to be seen. 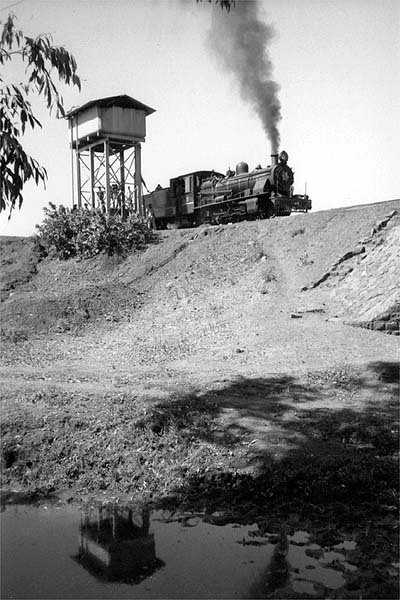 The section to Umarpada saw the engine get to grips with the ghat sections and the firing became more frequent resulting in some fierce stack talk. The line must have been surveyed to save money so there are some descents that lose the height so hard won and then the engine is back to climbing within half a kilometre. Nearing Umarpada the climb is continuous, the fireman took a break to point out to me the site of a train wreck, 2 overturned carriages lying at the bottom of an embankment, the train had been headed by a W class running back to Kosamba and had overturned after taking a curve too fast; the area was so remote that locals hadn’t scavenged the materials. 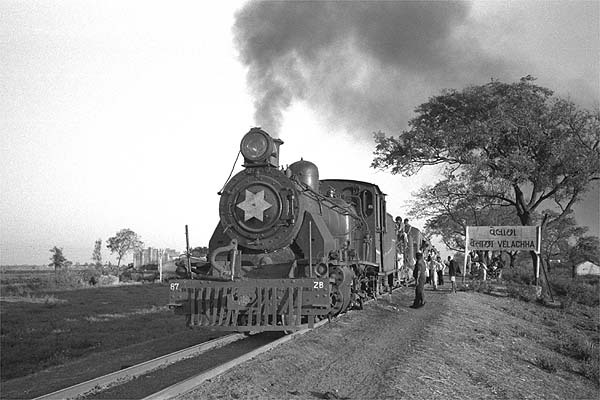 Umarpada was a just a station in an open area, a couple of houses nearby, timber strewn around the yard and a tent village for staff who had been sent to install a larger turntable to accommodate the ZBs. The crew made a real point of having a video taken of them on the new turntable and many volunteers wanted to help turn the engine. I found some shade and relaxed as the fireman shunted some of the stock to reposition the brake and the water gin, whilst the driver had lunch from his tiffin tray. The return journey saw us hurtle downgrade going full tilt into curves leaving wheel flanges screeching and my nerves screaming. The people riding the gin had a rough time with dust being kicked up by the engine from the close embankments, the fireman made it worse by using the blowdown in an embankment, causing a miniature storm of leaves to envelop them. They were very dusty and dry by the time we reached Zankhvav and had to beg him for a drink of water. We left the driver to shunt the train whilst the fireman and I went to the village tea stall. Leaving Zankhvav with the extra coaches we had to blast upgrade before settling to some free running on the favourable grades to Kosamba, the track was better ballasted than the ghat section and the engine rode easier on this section. We had gained time at both Umarpada and Zankhvav so were almost back on schedule. At Velachha (9km out) we had a prolonged station stop, enabling passengers to stare at the village girls bathing in the dam; it gave me a chance to get some low light shots of the train. It was dark by the time we entered Kosamba, after thanking the crew for a wonderful day I found a tap to clean up under. There was no food on offer (other than myself as a source for the teeming mosquito population). I watched an electric hauled freight composed of four wheelers make a complicated shunt move over crossovers to be put in a relief road and allow an express to overtake; a couple of flagmen swinging lanterns guided the driver as he manoeuvred the train back on the mainline after the express had been cleared. It was then allowed out in front of the passenger to Surat that was waiting to enter the station.